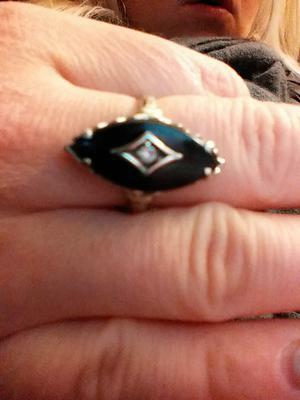 My grandmother gave me her black onyx ring but she did not remember how she acquired it. I admired it my whole life and she gifted it to me about 10 years before she passed at the age of 99. I can not find even one ring that is exactly the same. There is only one marking that I can read on the inside and it looks like a k. I wear this ring often and my grandmother wore it daily so I believe it is a quality metal, as it is in very good condition. I'm trying to find out how old it is and who made it. I had it sent to a jeweler through JCPenny to have the prongs fixed that hold the diamond and was told the diamond was not real. 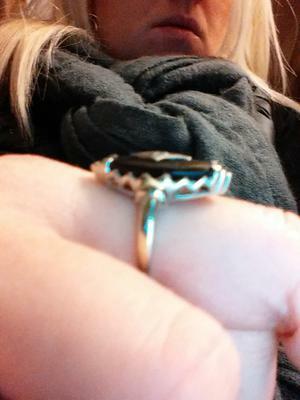 I did not have it fixed and would really like to have a real diamond placed instead. 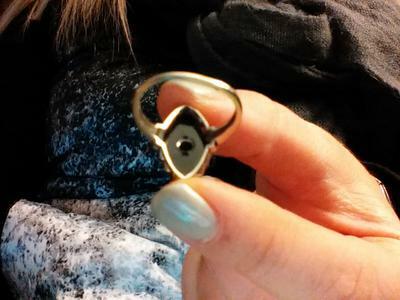 Any help finding this rings history is greatly appreciated!! Thanks so much! !